Baldwin Park, California, home of the country's first drive-thru, has banned drive-thru construction for nine months in an effort to combat obesity. Image via CS Monitor. The city of Baldwin Park, Calif. — the birthplace of the drive-thru restaurant — made the news this week after city officials banned construction of any new drive-thrus for at least the next nine months. 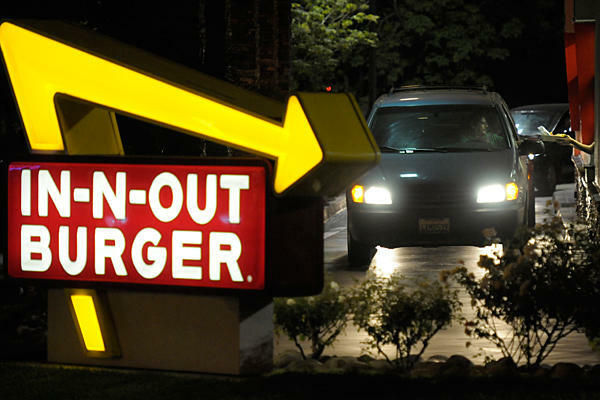 The first In-N-Out drive-thru burger joint was established in Baldwin Park in 1948; there are now 17 drive-thru restaurants serving the town’s 83,000 residents…and contributing to rising levels of obesity. City officials behind the ban said it was borne of their desire to cut away at “in-car dining” culture, which contributes to congested roads and clogged arteries. Fighting obesity and its associated health risks, like heart disease, was planners’ top priority. Fast food and car culture have long been linked to rising obesity in the United States. A 2005 study from the Centers for Law and the Public’s Health of Johns Hopkins University and Georgetown University focused specifically on how fast food zoning and bans on drive-thru services can help to combat obesity. It’s not only the food but also the drive-thru culture that keeps Americans fat. Reducing car dependence — and Americans’ proclivity to do everything from bank transactions to pharmaceutical pick-ups without getting out of the car — is essential to fighting obesity in the United States. Baldwin Park’s small step in that direction is a great example of the “health in all policies” principle that we wrote about a few weeks ago. Fortunately, the health in all policies (HiAP) approach is gaining momentum worldwide, as the public health community increasingly acknowledges that people’s health is mostly determined by factors outside of the health sector’s traditional sphere of influence — education, housing, and transport, for instance. In April, the World Health Organization (WHO) partnered with the South Australian Government to host the 2010 Health in All Policies International Meeting in Adelaide, Australia. The stated aim of the meeting was to move the HiAP agenda forward by “identifying key principles and pathways that contribute to action for health across all sectors of government, and engage the health sector in contributing to the goals of other sectors.” The Government of South Australia’s Public Health Bulletin from July features papers that were presented and recurrent themes from the meeting. Optimal planning for roads, transport and housing requires the consideration of health impacts as this can reduce environmentally costly emissions, and improve the capacity of transport networks and their efficiency with moving people, goods and services. Better transport opportunities, including cycling and walking opportunities, build safer and more livable communities, and reduce environmental degradation, enhancing health. Policies that bring more bike lanes, sidewalks and public space to poor urban neighborhoods, for instance, could help counteract a trend of higher obesity in low-income communities. Improving public transit connections for these neighborhoods can also help reverse this health inequity associated with transport, since most public transit trips involve at least one walking or biking segment.